Burkina Faso Lt. Col. Issac Yacouba Zida, right, leaves a government building after meeting with political leaders in Ouagadougou, Burkina Faso, Nov. 4, 2014 (AP photo by Theo Renaut). Late last month, the transitional government of Burkina Faso officially announced that presidential and legislative elections would take place in October. That came after two months of lengthy negotiations between the new government and the Independent National Electoral Commission, known by its French acronym, CENI, along with political leaders and civil society. The elections will formally conclude a consensus-based but nevertheless precarious political transition. 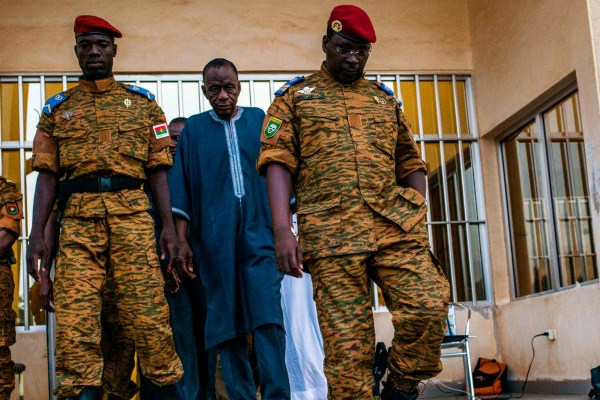 It will also mark the one-year anniversary of popular protests that forced the resignation of Blaise Compaore, who ruled Burkina Faso for 27 years.